Ok – it might be a little far-fetched to imagine the Olympic tennis champions performing calculations on the baseline but Nick Ovenden, a mathematician from University College London, has. "A fast serve can be an extremely effective weapon in tennis," says Ovenden. But no matter how fast you serve, you'll give your opponent a chance to adapt if you repeat the same serve each time. "The perfect tennis serve relies on keeping your opponent guessing about how the ball may bounce out of the service box – this can be achieved by putting spin on the ball." Ovenden worked with Acer and Intel to mathematically analyse the delicate balance of forces involved in a tennis serve as part of a series of activities to celebrate the launch of the new Acer Intel Ultrabook series. 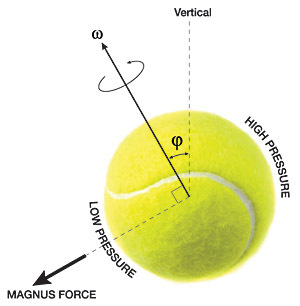 His analysis includes the three forces acting on a tennis ball as it flies through the air: gravity, aerodynamic drag, and something called the Magnus effect which results from the ball's spin. The Magnus effect comes from the ball spinning as it moves through the fluid (the air). "The fluid near the ball's surface that is travelling towards the flow will be impeded and thus slows down, increasing fluid pressure," says Ovenden. "In contrast, the fluid near the opposite surface of the ball that is travelling away from the flow will be speeded up lowering fluid pressure locally. The pressure difference across the ball then leads to a net force that curves the ball towards the low pressure side." A slice serve happens when the player hits the ball so that it spins like a top ( in figure 1). This causes the ball to curve from right to left in the air as it crosses the court. "If you are going to put slice spin on the ball then naturally the ball must start travelling in a direction to the right of the straight line [to your intended target] so it can curve back." 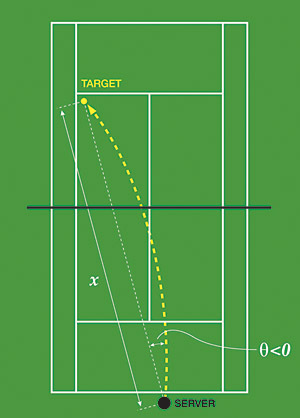 where is the vertical angular velocity (how fast the ball spins, measured in radians per second), is the balls initial speed as it leaves the racket, and and are constants that depend on the drag coefficient of the air and the straightline distance from the player to the impact point. As you'd expect, this slice constraint balances how far the slice spin moves the ball to the left with how far to the right the ball would hit if it was travelling in a straight line at an angle of : the greater the slice spin the wider the angle. Figure 2: A slice serve occurs when the ball is hit with side spin, causing the ball to curve to one side. where is the horizontal angular velocity, the ball's initial speed and is the angle of elevation of the ball's path (from horizontal) as it initially leaves the racket. The constants (which also appears in the previous equation for ), and depend on the air drag and the distance to the impact point, and the constant also takes into account the height of the player while also depends on the effects of gravity. The top spin constraint balances the extra downward force from the top spin, , with the speed and angle of elevation in order to make sure the serve hits the intended target: add top spin (increase ) and you have to hit ball faster (increase ) or aim higher (increase the angle of elevation ). where the constants and are all of the same form as the constants in the above equations, but have values depending on the distance to, and height of, the net at the point the ball crosses.